P. ciliatum Ell. Bot. S. C. & Ga. 1: 126. 1817. Plant yellowish green. 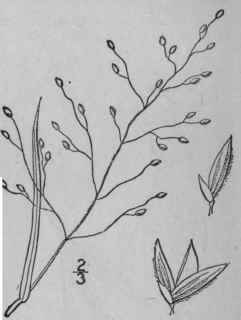 Culms tufted, 4'-7' tall, simple, glabrous; sheaths shorter than the internodes, ciliate on the margin, otherwise glabrous; blades up to 2 1/2' long, 2 1/2"-5" wide, glabrous on both surfaces, conspicuously ciliate, somewhat crowded at the base, narrowly elliptic, linear or lanceolate; panicle I'-2' long, broad, open, its axis and spreading branches hirsute; spikelets about 1" long and 1/2 as wide, elliptic, pubescent with short spreading hairs, rarely nearly glabrous. In sandy soil, southeastern Virginia to Florida and Mississippi. May to July. 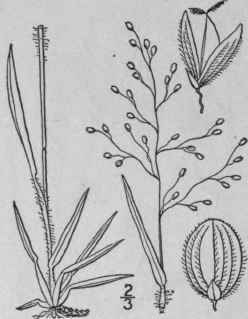 Panicum strigosum Muhl. ; Ell. Bot. S. C. & Ga. 1: 126. 1817. 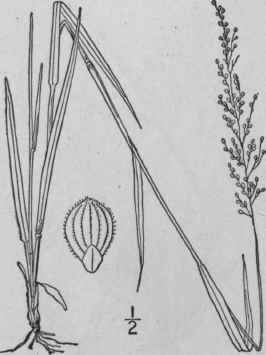 Panicum longipeditnculatum Scribn. Bull. Univ. Tenn. Exp. Sta. 7: 53. 1894. Culms 8'-18' tall, simple, tufted, hirsute; leaves crowded at the base of the culm; sheaths much shorter than the internodes, hirsute; blades l'-3' long, 3"-4 1/2" wide, erect, lanceolate, papillose-ciliate on the margins, long-hirsute on the surface; panicle much-exserted, 1 1/2'-3' long, the axis long-hirsute, open, its branches spreading or ascending; spikelets 3/4" long or a little less, oval, glabrous. Sandy woods, southeastern Virginia to Tennessee, Florida and Louisiana. Also in Cuba, Mexico and Guatemala. May-Aug.
Panicum laxiflorum Lam. Encycl. 4: 748. 1797. Panicum xalapense H.B.K. Nov. Gen. & Sp. 1: 103. 1816. Culms erect, 8'-16' tall, simple, glabrate, the nodes barbed. Sheaths shorter than the internodes, hirsute with reflexed hairs; blades 2 1/2-5' long, 2"-5" wide, erect, generally narrowed at base, long-acuminate, pubescent or glabrous, excepting the ciliate margin; panicle 2'-4' long, its axis and erect or spreading lax branches sometimes hirsute; spikelets about 1" long, ellipsoid or narrowly obovoid, strongly pubescent; first scale minute, 1-nerved; second and third about equal, 9-nerved, very pubescent, as long as the shining obtuse minutely apicu-late fourth one; third scale usually with an empty palet. Moist soil, Maryland to Missouri, south to Florida and Mexico. Cuba and Haiti. June-Aug.
Panicum angustifolium Ell. Bot. S. C. & Ga. 1: 129. 1817. 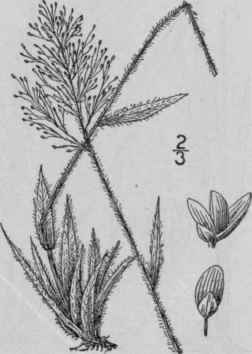 Panicum consanguineum S. Wats, in A. Gray, Man. Ed. 6, 633, in part. 1890. Not Kunth, 1835. Culms erect, 1 -2 tall, glabrous or pubescent toward the base, at first simple, later profusely branched above. Sheaths glabrous or the basal ones pubescent, those on the culm shorter than the internodes, those on the branches crowded; blades elongated, 3'-6' long, 1"-3" wide, narrowed to the base, firm, glabrous, those of the culm distant, those of the branches shorter and crowded; primary panicle long-exserted, 1 1/2'-3 1/2' long, its branches spreading; lateral panicles smaller, shorter than the leaves; spikelets few, about \\" long, elliptic to obovoid; first scale one-fourth to one-third as long as the spikelet; second and third oval, 9-nerved, pubescent; fourth oval, minutely pubescent at the apex. Dry soil, Pennsylvania to Florida and Texas. June-Aug.